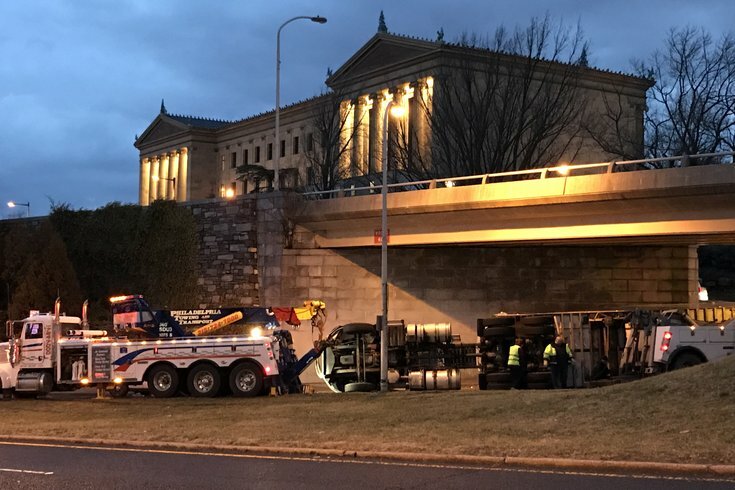 A tractor-trailer headed from Eakins Oval to the outbound side of Martin Luther King Drive crashed and landed on its side near the Philadelphia Museum of Art on Friday, shutting down the ramp and rerouting traffic in the area. A tractor-trailer overturned near the Philadelphia Museum of Art on Friday afternoon. The driver lost control of the truck before 4 p.m. Friday, 6ABC reported. The truck crashed and turned on its side on the ramp from Eakins Oval to the outbound side of Martin Luther King Drive. The truck was still laying under the Spring Garden Street overpass as of 5:45 p.m. The ramp was shut down, and the outbound side of MLK Drive remains closed from Eakins Oval toward Sweetbriar, the station reported. Police also shut down Kelly Drive between Fairmount Avenue and the art museum. There is no word on injuries or a possible cause of the accident.